As the word "well-come" means, you are all well-come to my web site to see the surprises and beauties of my colorful world. Among the products I have all-ready designed, if there is any specific one you liked as you prefer to suit specifically to any of your dresses, you can choose the style you prefer and inform me specifying the code. 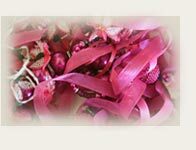 I can design a new special item for you that would go well with your dresses. Also, for very unique designs for your night dresses, you can send me a piece of garment. I will work on it, determine the price and inform you. If you are not able to send me a piece of garment, please take a close picture of your material and send it to my e-mail address. I will start making the product immediately after your approval. The product might be a necklace, an earring, a bracelet, a broach or a bag. Painting has meant a lot to me since I was a child. When I was in primary school, I would not miss any painting competition. Painting has become an inevitable part of my imaginary world, since I was a young girl. As time went by, sculpture became my second hobby. At the age of 18, I was in the Faculty of Law, in İstanbul University, never ending my dreams and pleasures in the depth world of art. 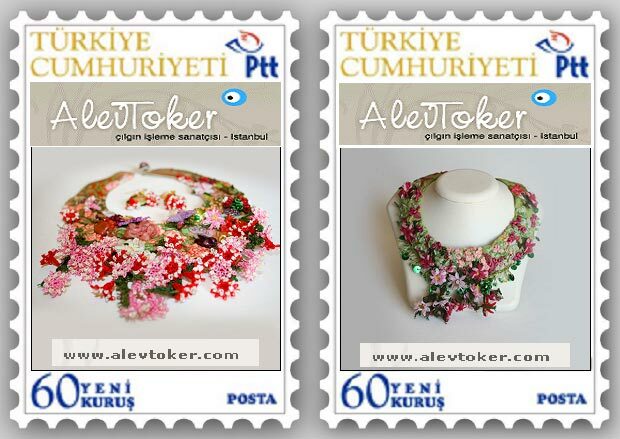 Alev Toker Designs are now in stamps. 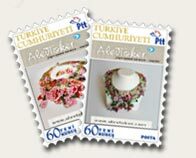 You can find them in every post office around Turkey. 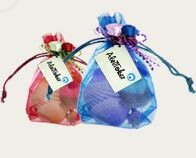 All Alev Toker Designs are sent in Alev Toker's special design gift poachers. It's a cotton fabric, so thin that it shows on both sides when used. It's special in Turkey. It's generally used by women working on the fields in rural areas to keep their hair away from their faces and to protect their heads from the heat of the sun. It is anti- perspirant.